FILE - President Donald Trump listens to a question during a ceremony in the Oval Office of the White House in Washington, Oct. 11, 2018. President Donald Trump criticized growing condemnation of Saudi Arabia and allegations it is behind the disappearance of a Saudi journalist, saying, "Here we go again with, you know, you're guilty until proven innocent," in an interview Tuesday with the Associated Press. In this Tuesday, Oct. 9, 2018 file photo, a security guard walks in the Saudi Arabia consulate in Istanbul, Turkey. The Trump administration’s ongoing courtship of Saudi Arabia is on pause. 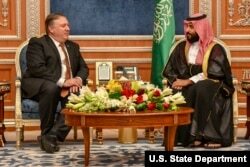 Secretary of State Michael R. Pompeo meets with Saudi Crown Prince Mohammed bin Salman, in Riyadh, Saudi Arabia, Oct. 16, 2018.